Most hairstyles require time; this fabulous 5 step “how-to” is super easy for gorgeous curls! Step 1: Wash and condition your hair very well; you want to make sure there aren’t any knots so you can run your fingers through your hair easily once dry. Step 2: Comb through wet hair with your favourite mousse. We love L’Oréal Professionnel’s blow-dry volume mousse VOLUME FULL VOLUME EXTRA. This divine product creates overall volume without weighing your down. Step 3: Divide your hair into approximately 8 sections (see middle, top image). Blow-dry one section, then twist into a knot and secure with a bobby pin. Repeat this procedure with the other sections. Step 4: Once done apply heat, with a diffuser or hairdryer, over the knotted areas for 2 – 4 minutes. Wait for 5 minutes then remove the bobby pins (see middle, bottom image). 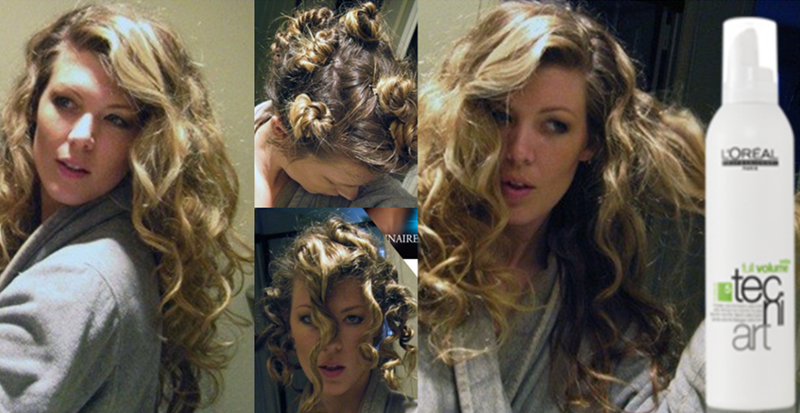 Step 5: Run through your hair with your fingers, do not brush out, for gorgeous curls. Apply a hairspray to lock in the curls. We recommend L’Oréal Professionnel’s VOLUME PLI, a heat-activated setting spray.